Our largest volunteer turn-out is organized for our annual “4H” planting day. This day is usually the first Saturday in May (weather depending). 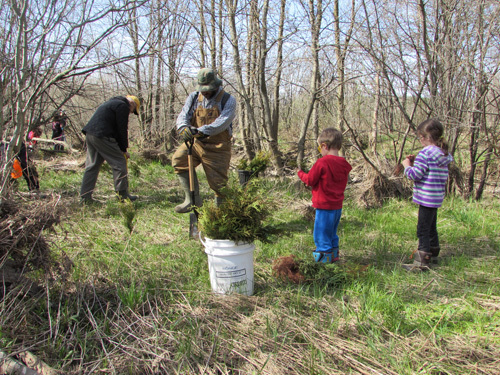 The 4H Conservation Club of Ripley leads the effort in planting tree seedlings with the members of PRWIN. Additional local families and friends also volunteer their time for this fun event. Lunch is on us! Please click below for our email address. Let us know if you are available for this annual volunteer tree planting event. We would love to have you! If other volunteer opportunities become available with our on-going projects and programs, we will post them on our website! The PRWIN Board of Directors also volunteer their time, expertise, and passion every day to our organization! We could not implement the in-ground projects and programs without them. If you are interested in becoming a PRWIN Director, please call or email us for more information. Our monthly meetings are held in the mornings on the first Wednesday of every month here in Ripley, ON. You can commit as much time as you feel comfortable.